So what do you want in an inventory tool for the hardware and software on your network? How about easy installation, complete data and efficient data transmission and storage? With these design points working in its favor, LANutil is a tool worth considering. LANutil Elite includes the LANutil Iventory product for hardware asset management and software license management, along with a software distribution component and a PC remote control product called PC-Duo. Vector Networks also offers LANutil Inventory or PC-Duo separately, or in different combinations with the software distribution component. For this review, I explored the whole Elite package. LANutil is extremely efficient, requiring very few resources to run the console, house the database, run the client or even pass the inventory data. The console system requires a mere 15MB of free disk space and runs on Win9x, NT 4.0, or Windows 2000. The database requires only the ODBC Drivers for Microsoft Access, though for a more robust database you can also use Microsoft SQL Server 7 or Oracle (7 or 8). Not having to purchase a special database engine makes the price easier to justify for a small company. The client software requires only 3MB of free disk space; you can run it on DOS 3.3 or higher, Windows 3.1, 9x, NT4.0 or Win2K. LANutil’s console installation takes you through configuring the initial database for your site. Once that’s finished, simply install the client component and it pushes that node’s first inventory data, including hardware and software inventories, to the console. The push sends data in pieces, so it takes a few minutes to show up in the console, but this also prevents the application from draining your network resources. When you view the inventory at the console, you have the choice of publishing it to the database or leaving it to be overwritten by the next inventory for that node. 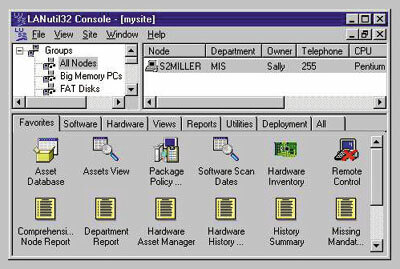 You can also inventory non-networked systems via floppy disk. The inventory seemed very complete. It picked up a lot of detail, including the operating system version and serial number, all the disk capacities and free space, the NIC model and configuration information, the display type and even its current settings, as well as drive redirections and network shares. Some of my software wasn’t detected, so I followed the simple steps to use Package Database Editor for adding software to recognize. LANutil provides software license management through License Groups that you define, specifying computers that should have (or not have) software installed. Then you run the License Group Analyzer, which compares the license groups to the software inventory information in the database for those nodes and displays the results. This way you can keep track of discrepancies between your installed base and actual licenses. PC-Duo for remote control works great. It has all the features I expected and more. The drag-and-drop file transfer is easy. It also has an option to synchronize directories. I configured the TCP/IP address manually, but it has a browse option too. You can chat, send messages, send and receive the contents of the clipboard and even enable audio communications. The space in this review only permits me to scratch the surface of the rich features in PC-Duo. The LANutil Console design provides the Groups, Nodes and an intuitive Favorites panel. If you need a PC-management tool, LANutil Elite has the features to do the job. Along with inventory, license management, software distribution and remote control, it also has a scheduling system to automate these tasks. The great thing is, with an efficiency of software design, the package doesn’t degrade your system or network performance. Sally Miller, MCSE, is network administrator at a medium-sized manufacturing company with a distributed WAN. She hopes to upgrade her certification to Windows 2000 as experience permits.